Easter decorations to DIY a memorable Easter year after year! 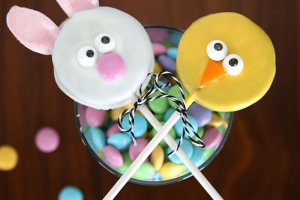 Carly shares her ideas for quick and easy Easter decorations with Baby Hints and Tips. Do you decorate your house for Easter? 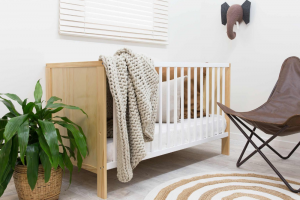 If you take your cues from home styling magazines, then it may be the norm for many families around Australia. Me? Well, last year for my daughter’s first Easter I bought for her two little pink bunny ornaments, a little bunny plate and some tea towels. I will bring out the bunnies and I might use one of the tea towels for decorative purposes. It got me thinking, what other Easter decorations are available out there? Can you create your own Easter decorations that are special for your family? I stumbled across an adorable Easter bunting the other day. It was a bunting covered with a bunny and Easter egg pattern. Too cute! Buntings are perfect to hang up on Easter Day, particularly if you invite a big crowd to celebrate with you. If you’re feeling crafty, you can whip out the sewing machine (or even paper craft) and create some bunting flags for your own family. Keep en eye out for remnants with bunny, egg or brightly coloured themes! These are the ultimate Easter decorations because, like the Christmas tree, they can brought out every year – making your very own Easter tradition. OK ladies, it’s time to put your crafting hats on. 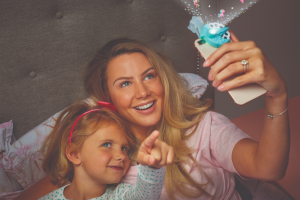 Like keepsakes that we bring out every year at Christmas, it’s time to create some pretty little family mementos for every Easter morning. Can you stitch a little bunny for each child to place on top of their Easter morning swag? Is there a sweet little bunny photo frame to be made and updated with a family photo each year? The craft stores have come ahead great guns when it comes to Easter ideas, so it’s time to get your Easter craft on! For those celebrating a more traditional Easter, this is the ultimate time of year to bring the family together around your beliefs. As the most solemn, joyful and praiseworthy period on the Christian calendar, Easter should, some could argue, be the most important event of the year. Traditional Easter decorations could include creating your very own stations of the cross artwork for home. For those “less crafty” grab some palm leaves and create a beautiful centrepiece for your Easter celebrations. It’s not just flowers that can go in a big vase! Some of the favourites for kids is a spin on the “fairy garden” where mums create a “cave of clay” with a boulder pushed aside. 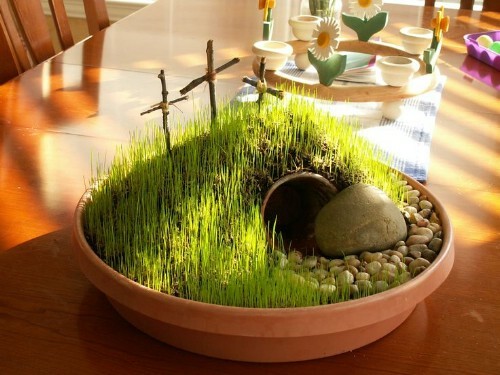 The beauty of this religious Easter decoration is that the grass seeds (or chia, or other fast growing sprout) can be sprinkled anew every Easter – in the week before. The Easter decoration will “rise again” by Easter Sunday, bringing forth new life. This is a simple Easter decoration that can help you cut through the noise of “chocolate frenzy Easter” and explain the true meaning to young children. Decorating your home in an Easter theme can be an elaborate undertaking. 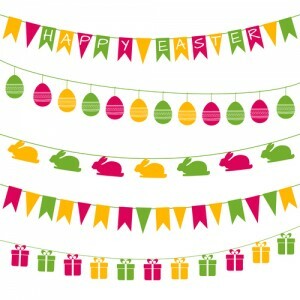 However, the simple addition of a couple of Easter ornaments and accessories can be just as effective. By putting away your Easter ornaments the way you would Christmas decorations, you can create an Easter tradition that lasts year after year – and helps your kids remember Easter for more than just the chocolate! Table decorations can be as simple as a centrepiece made of palm leaves and hand painted eggs or you can go all out and make a centrepiece to bring out year after year! For those with a love of fabric – creating an easter themed table runner or cloth – hand painted or simply stitched will evoke memories of Easter for kids for years to come. Consider ‘birds nest” themed table centrepieces filled with hand painted plastic eggs or even egg shaped candles for those with a waxy gift! Look beyond bunny printed plates (although those Peter Rabbit bowls are beyond cute) and get your kitchen craft on. Easter decorations that are good enough to eat? Yes please! Not a whiz in the kitchen? Bunny jelly moulds are available at most stores and a marshmallow bunny with coconut covering makes for a pretty impressive “Easter Cake” for the mum who isn’t a great cook! Egg moulds don’t have to be used for chocolate! Nobody is the boss of you – you can use them to create whatever you fancy. Cheese balls are simple to create in an Easter Egg theme – especially if you love your cheese ball covered in bright herbs or caviar. Use your egg shaped moulds to create adorable entree options! Use a melon baller to create little single serve, bright fruity treats that will load them up on vitamins, not sugar. And let’s not forget re-purposing cookie cutters. Yes, every store has Easter cookie cutters right now. These can be used to make festive fruit shaped toddler friendly desserts or even centrepiece veggies for your Easter lunch roast. Don’t forget your baked baby carrots, devilled eggs, hot cross buns and other traditional Easter treats – Easter food isn’t just about the sugar! There are many different books that you can purchase that are centred around the theme of Easter. You can buy picture books that explore the religious aspects of Easter or books that detail what happens at Easter (such as the all-important egg hunt!). Books are a great way to decorate your house, by simply displaying them on a shelf or bench space, and they can be used to create a little Easter scene. They also double as a great experience for the family to sit down and read before bed. Share your quick and easy Easter decorations below. Carly is a new mumma to her daughter Scarlett. She is an Early Childhood Teacher who loves working with the under three year olds and has been blogging since 2008. Carly is busy with her own business, Little Lettie Boxes, during the day when Scarlett is sleeping. She currently finds the time to update her blog Life Will Never Be The Same on weekends and will always post photographs to her instagram account.